Amherst College is a highly competitive school and its admissions statistics make Amherst College one of the 50 most competitive schools for undergraduate admissions globally. 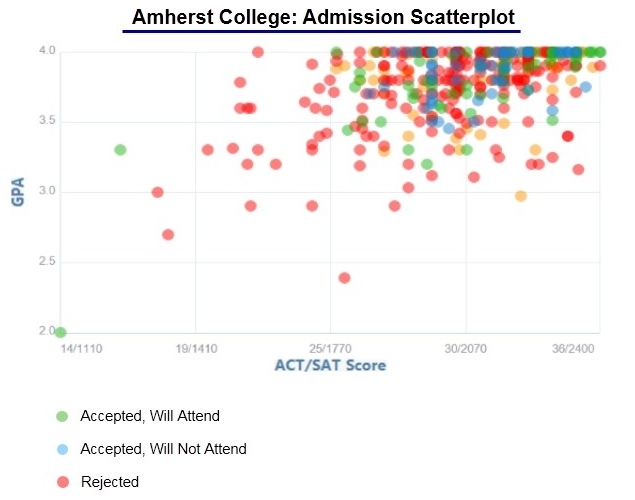 Similar to the trends across all top schools, Amherst College acceptance rates have continued to decline over the past 8 years and will almost certainly continue to do so into the future. 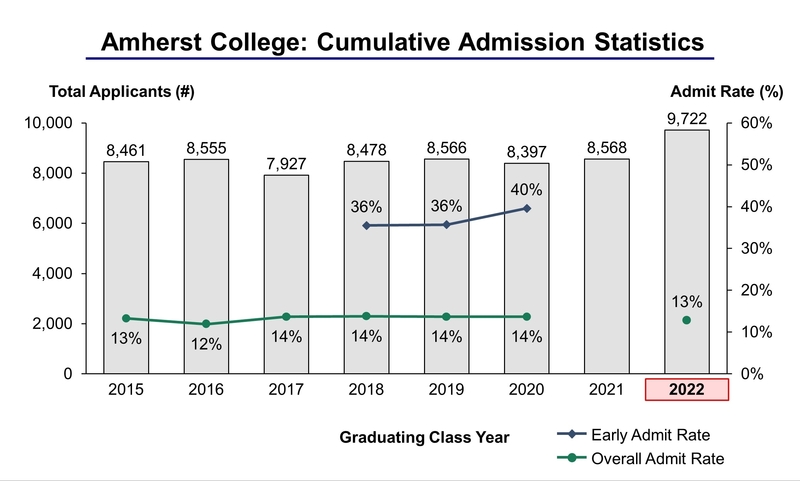 The Class of 2022 was the single most challenging year to be admitted to Amherst College ever. For the Class of 2022, 9,722 students applied to Amherst College of which 1,244 students were accepted, yielding an overall acceptance rate of 12.8%. Overall applications increased by 13.5% over last year (2021 to 2022) from 8,568 to 9,722. Founded in 1821, Amherst College is located at the heart of the Pioneer Valley in Amherst, Massachusetts and has become one of the top small private liberal arts schools in the United States. The beautiful 1,000 acre campus includes a 500 acre wildlife sanctuary, while the college libraries hold more than 1,517,000 books and more than 595,296 other media materials, including 330,394 e-books. Amherst College has an endowment of $2.15 billion which equates to $1.2 million per student. Amherst College has a student/faculty ratio of 8:1, with students frequently working one-on-one with faculty, many of whom are among the nation’s leading scholars and who have received awards from the National Institutes of Health, the National Science Foundation and the Mellon Foundation. Many Amherst College alumni are evidence of the school’s scholastic teaching ability in such areas, including Dr.Warren Fales Draper, Deputy Surgeon General of the United States Public Health Service; Harold E. Varmus, Director of the National Institutes of Health; Dr. Barry R. Bloom, recipient of the Robert Koch Prize, expert in infectious diseases and dean of the Harvard School of Public Health. Amherst College has thirty-eight majors in the arts, humanities, natural sciences and social sciences, and enrolls 1,785 students annually. The college has more than 200 full-time instructional faculty and ninety percent of Amherst College classes have fewer than thirty students. In fact, the average class size is sixteen students. Amherst College boasts an “athletics program that is the oldest in the country” and has won a seventy NCAA Division III individual titles and ten team championships). Amherst College also has 100 student organizations and a number of college traditions, one of them being an interesting way to get the “coolest dorm room”; the annual Lip Sync show allows students to perform skits and dances set to popular songs in order to get the highest Room Draw Number. Most lab/discussion groups have 10-19 students.